I’ll start with the atmosphere. eSAX feels like a ritzy event from the moment you arrive. You walk down a long yellow/black carpet to a table with a friendly staff member, who helps you to get registered and directs you to another staff member who helps you to find your name tag lanyard and gives you a bag of goodies. The bar is almost immediately to your left once you walk in, and they serve a variety of alcoholic and non-alcoholic drinks, including their signature drink, the Sax on the Beach. High top tables are set up, and loaded with candy, where attendees mingle, eat and drink until the speakers begin. On the menu is a variety of wraps from the Pita Pit, with an option of gluten free/vegan, which I loved, with cookies for dessert. In the main body of the room, there is a series of tables set up, with various small businesses advertising and networking with attendees and one another. It’s an intelligent setup that really facilitates interaction. eSAX always has a great lineup of speakers, and this event was no exception. The speaking began with an introduction from Dylan Black, MC/Host. I know Black only from hearing his voice on the radio, on boom 99.7. I’ve always enjoyed his comedic style on the air, and seeing/hearing him in person was just as great. Despite speaking to a ‘quiet-ish’ crowd, Black was incredibly entertaining. Even more impressive than his MC’ing skills, was hearing about what he is involved within our community. A major supporter of CHEO, the Children’s Wish Foundation, the Max Keeping Fund, and blood donation, Black encourages and inspires others to make a difference in our community as well. He’s also a follower of Covert Ottawa Guy on twitter, which is pretty cool for me! The featured speaker of the evening was the Canadian Chamber of Commerce. The speaker provided an outline of what the COC has to offer entrepreneurs, and highlighted some incentive programs and benefits that the Chamber can offer. It was a very informative speech, and I heard multiple people comment that they had picked up some useful tips that they hadn’t known about. Also on the agenda was the Ontario Chamber of Commerce, but that speaker was unable to make it. This allowed for Dylan Black to get back to the podium, and he kept the audience laughing and the evening running smoothly until Jarrod came up to speak. Jarrod, known for his signature fedora, is a great speaker, and really lights up a room. He spoke to the audience about the misconceptions about networking, and about how networking shouldn’t be an awkward and uncomfortable process. It was a really great topic, and certainly changed my own perspective on networking for the better. It was a really positive and inspirational talk; he kept the audience’s attention and shared some valuable experiences and information. Next up, there were a number of draws for door prizes. Attendees had to be present to win, and I saw a lot of excited people head up to the stage to claim their prizes. All that one had to do to enter was to drop a business card in a barrel on their way into the event, which I think is a nice change from typical raffle style prizes. Once the door prizes had been awarded, there was another exciting draw: The ACER Cold War Museum Fighter Jet Charity Draw was a highlight of the evening for me. I REALLY hoped that I would win this prize, but unfortunately, I didn’t. The prize was a ride in a real fighter jet. Just listening to the description of the ride prompted me to purchase multiple tickets. ACER is a non-profit organization, and the proceeds from the eSAX draw went to charity, which I think is amazing. You can check out their website here if you are interested in booking this flight of a lifetime opportunity for yourself: https://acmadventures.com. It sounds like a great adventure for a great cause! Topping off the prize draws was the draw for the 50/50. The pot wasn’t massive, but the proceeds went to support a few very worthwhile charities-always a bonus! After the door prizes and draws had wrapped up, there was about an hour of mingling. Jarrod was in the crowd, ever the engaging host, saying farewell to attendees, ensuring that everyone had a great time. This eSAX was the best yet; this event just gets better and better with every one! If you are an entrepreneur, it’s a great way to network with other entrepreneurs and small business owners. If you’re looking at doing some networking and meeting some great members of the community, I would highly recommend checking eSAX out. You can find details of the next event, including ticket information, on their website at http://esax.ca/. Tell them that Covert Ottawa Guy sent you! https://esax.ca/wp-content/uploads/2017/01/eSAXLogo-High-Rez.jpg 850 850 mmstaff http://esax.ca/wp-content/uploads/2016/11/eSAX-2016-logo-200.png mmstaff2017-06-06 18:24:142017-06-06 18:26:40eSAX Is Changing the Face of Networking Events.. This Is How! Have you ever heard of the 6 degrees of separation theory? It states that one person can be connected to any other person on the planet by knowing no more than 6 people. Through the chain of “a friend of a friend” one person has the opportunity to connect with every single individual in the entire world. Everyone knows that having a strong web of business connections is ideal for any entrepreneur, but where do you even find the opportunity to meet these new people and expand your network? This is exactly what Jarrod Goldsmith, founder of eSAX experienced when trying to find gigs for his band Sax Appeal. By attending networking events, Jarrod literally branded himself as a natural networker and soon sprouted the idea of eSAX, an entrepreneur networking group for startups to create connections, gain knowledge and promote collaboration among regional Chambers of Commerce. Holding events every 3 months to coincide with the provincially funded Y-Enterprise Centre Ontario Self-Employment Benefit Program (OSEB), eSAX’s purpose is not to compete with other networking events. Rather, eSAX provides additional opportunities for (primarily new) business owners to network among some of the region’s most prestigious business leaders and organizations, to learn entrepreneurial skills, and to create more cooperation among all the Chambers of Commerce within the region. With years of experience and a web of entrepreneurial connections throughout Canada, we are proud to have eSAX on board as a community partner for the Ottawa Funding Roadshow. Why did you decide to join the Funding Roadshow? Following ones passion by creating a startup has many challenges. One of the largest hurdles is spreading the word and having the right kind of community engagement so that people/organizations who share the vision can learn what you have to offer. Having eSAX join the funding roadshow is a great way to leverage such an excellent opportunity to many of the regions’ startups who may otherwise never have heard of it. What does it mean to you to be a partner in a nationwide event helping entrepreneurs? It’s a great feeling knowing that what eSAX is accomplishing in Ottawa can be used to help encourage, promote and share resources among startups across Canada. eSAX is built on the foundation that entrepreneurs should try to help one another succeed. When people think about Jarrod Goldsmith, the first thing that usually comes to mind is his majestic fedora. Jarrod has been a key factor in Ottawa’s entrepreneur and small business progression by creating networking events that bring ~450 entrepreneurs together every three months. But who is Jarrod Goldsmith and how did eSAX all get started? At a young age Jarrod knew that he was passionate about music; so becoming a musician seemed to be the right course of action for him to take. Although there were doubts from his family and friends, he never allowed himself to get discouragement or veer away from his ultimate goal – which was to have music continue to play an important role in his life. When Jarrod attended McGill University, he did not receive his honours in the topic that everyone thought he would have. Instead, he went completely left field and received his honours degree in anthropology (Although he continued performing in bands at McGill and around Montreal). Once he completed his undergraduate studies, an anthropology Masters program at the University of Alberta was the next step in his journey. Continuing where he left off at McGill, Jarrod was not only involved in extracurricular activities, but continued to also be active within the music community, auditioning for bands and playing many venues around Edmonton. Over the years he had the opportunity to travel considerably, pursuing both archeology and performing music. After graduating, Jarrod never knew where he was going to land his next gig or potential job. Government work seemed to be the way to go, but after many contracts within different departments, his options were spreading thin. Jarrod Goldsmith did what everyone told him not to do – he started a band and thus SAX Appeal was born. Since very few people have ever heard of a saxophone group such as this and considering there was simply no market for an all saxophone ensemble, Jarrod needed to create one. This took a lot of networking. After connecting with all of the hotels, event planners, wedding companies and corporate communities around Ottawa, Jarrod looked for additional contacts through Chambers of Commerce. Usually when a business owner joins a Chambers of Commerce, it is because they reside or do business within the boundaries of that specific geographical community, but not Jarrod. Since he would take a gig anywhere around town, he joined ALL of the Chambers of Commerce in the Nation’s Capital, and in doing so, realized that there was one fundamental flaw that he could not get out of his head; each Chamber of Commerce often do not collaborate with one another. Jarrod began hosting events every three months; originally to coincide with the Ontario Self Employment Benefits Program. These events bring the various chambers together to help fellow entrepreneurs and businesses around the community. No other organization had ever done this before. Many entrepreneurs face a similar problem; they were inexperienced startups that did not have the familiarity of networking. eSAX (The Entrepreneur Social Advantage Experience ) was soon born. These events allow startups and small businesses to connect with one another and build partnerships, leads, and relationships within Ottawa’s business community. An eSAX event is not your typical event – it actually has all of the bells and whistles of a celebrity event! It is a venue where other like-minded individuals can network and build their business, while a unique live saxophone ensemble (provided by the one and only SAX Appeal) sets the nights’ atmosphere. Events like these are not places where others hand out their business cards like a feeding frenzy; it’s a place where compatible professionals celebrate small businesses in their community. These events have become so popular that #eSAX trends on Twitter. When Jarrod isn’t at networking events, or hosting his own, he can be found creating YouTube videos through his “Ask The Fedora” channel. These videos discuss a wide-range of networking and businesses tips, and provide people with the encouragement and knowledge to better approach their networking endeavors, while making them less stressful and more successful! A lot of people can get discouraged from their dreams. Many people face obstacles that seem too high to climb. Countless numbers of people bail before the ship sinks. He not only did what his peers said he couldn’t, but he found a unique trait along the way that allowed him to create his own environment where he could succeed. Not many are willing to take these tough steps, but all of us owe it to ourselves to at least try. Jarrod is a perfect example of the notion of what you believe, you can achieve. For information on upcoming events, and to receive networking tips and advice, like and follow eSAX on Facebook, as well as Ask The Fedora on Twitter. You never know where you’ll find the fedora next! 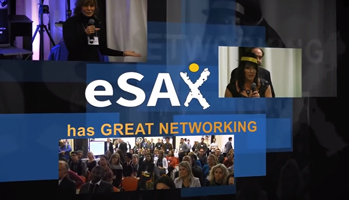 Check out this short promo video for an idea on what to expect at an eSAX event. Jarrod got a chance to sit down on an “Ottawa Experts” panel with Rogers TV to discuss some tips for success as an entrepreneur. Learn what it takes to go from a “Wantapreneur” to an entrepreneur in this live television panel discussion featuring some enthusiastic business leaders, all from Ottawa, Ontario, Canada. A local musician is putting his creative touch to the concept of networking. Now, his events, dubbed eSAX (entrepreneur Social Advantage Experience) are starting to grow. In fact, saxophonist Jarrod Goldsmith said Wednesday afternoon he expected about 300 entrepreneurs to attend his latest gathering at the Marriott that evening. Mr. Goldsmith said the events are held every three months to coincide with the Ontario Self Employment Benefits Program (OSEB), a provincially funded program provided by the YMCA-YWCA. Mr. Goldsmith went through the program three years ago. An archaeologist by training, he realized then that if he wanted to treat his passion – music – as a viable business, he needed to network. “So I joined all the chambers of commerce … and I hosted events to bring together the collaborative efforts of all local chambers of commerce to help offer resources for startup entrepreneurs,” he said. Each event features one chamber. Ian Faris, president and CEO of the Ottawa Chamber of Commerce, is one of the speakers Wednesday. The events typically run for three hours with an hour-and-a-half of networking to start, speeches and question-and-answer sessions for 45 minutes in the middle and more networking to wrap up the night. And of course, Mr. Goldsmith’s musical group Sax Appeal provides the entertainment. He said learning is a big part of the event, which is why the speakers are there, but really, it’s all about making connections. He said there will also be live tweeting from the event (#esax). Mr. Goldsmith said he paid for the event himself for the first two years but now has sponsors helping him out, and as the event grows, people are starting to take notice. Peter Stewart, manager of Entrepreneurship Services with Invest Ottawa, said the event is just what the Ottawa business community needs. and make connections to entrepreneurs all over the community,” Mr. Stewart said in a statement. These connections are proving to be not only good for eSAX, but also for Mr. Goldsmith’s music project. “I joined all of the chambers of commerce and then, bang, right away I started getting corporate gigs and in so doing, my name and my brand was growing and that is one of the reasons why eSAX is taking off so much,” he said. 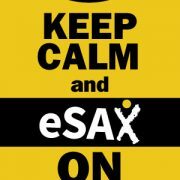 The story of eSAX and all of the great benefits have reached far and wide here in Ottawa. 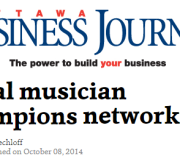 So much so that Jarrod Goldsmith–the founder of eSAX–was featured in the Ottawa Business Journal. Jarrod Goldsmith was invited to speak with CBC Radio to discuss what it takes to become an entrepreneur, and sustain your success. He sat down with Marie-France Marquis (Half Full Glassware) and talked about his journey toward becoming a local leader. https://esax.ca/wp-content/uploads/2017/01/eSAXLogo-High-Rez.jpg 850 850 eSAXnetworking http://esax.ca/wp-content/uploads/2016/11/eSAX-2016-logo-200.png eSAXnetworking2014-03-30 15:26:312017-03-08 17:12:27Why did you become an entrepreneur?